The Gordon Flying-Fox Camp is one of Sydney’s secret treats. 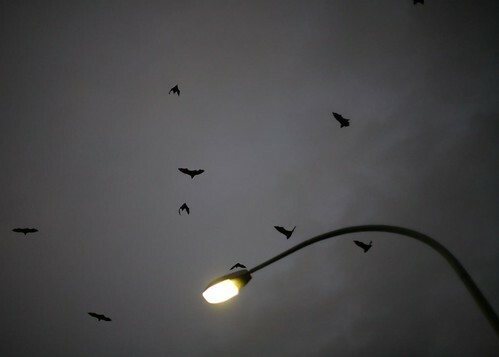 Every night between October and March, the bats from this site head out en masse for their evening jaunt. In their ten-thousands. That’s a lot of bats. Wait on the Rosedale Road bridge, and about 20 minutes after sunset your patience will be rewarded. First you’ll spot a few loners taking flight in the distance, and before you know it, the sky will be full of them. A great excursion for a Summer night. Rosedale Road bridge (between Minns Road and Glenview Street) – 10 minutes walk from Gordon railway station. This entry was posted in Family, Free, North by Sydneyfile. Bookmark the permalink.